'Elvis Presley: Past Masters' is a collection of 22 songs from Elvis' catalogue that were not available on his original albums. 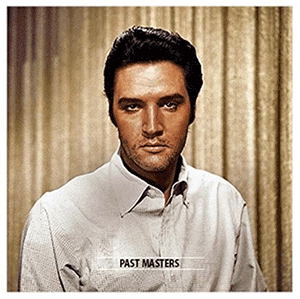 The majority of Past Masters consists of A- and B-sides from Elvis' singles and Extended Play's (EP's), including versions of songs that appeared in a different form on his Long Play (LP) albums. Also included are the full contents of the Elvis Sails EP, masters without any overdubs and 'Kiss Me Quick' without backing vocals as released on the 1964 Spanish EP Viva Las Vegas. On this album you can also hear six songs that Elvis recorded at Sun Records in 1954 and 1955, including 'Mystery Train' from the original HMV 78rpm. This is a special edition from the Elvis One label. ** As released in it's original 'dry' form. *** Previously unreleased by Elvis' record company on CD. I find this at least a bit more interesting than other releases of recent times trying to grab a quick buck. More thought than most appears to have gone into this project and I thought I might see my long lost 'It Hurts Me' Italian release, but alas no.